I am not really sure where to start with this one but here it goes. 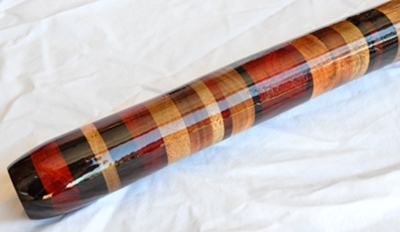 To start this didge is pretty wild looking and sounding. This is the first G that I have made and it is high pitched and full of energy. I combined two really dense old stalks but then decided it would be fun to make it even more unique by adding a 13″ mouthpiece full of some incredible woods. This long neck and huge bell at the end create some astonishing rhythmic abilities with incredible volume. The bore near the bell is so big I can reach my whole arm up to my shoulder in it. There are a ton of bass notes that hit almost like a drum when you get it just right. Overtones are beautiful and easy to reach especially the first deeper overtone. I wouldn’t recommend this to a beginner but someone who has played for a while as it can be a little intimidating at first. 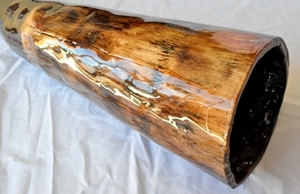 A one of a kind didge that would be a great addition to someones collection!